Fleas: We love to hate them! We spend remarkable amount of time, energy and money controlling these tiny, yet supremely irritating parasites. Almost of all of us have had pets driven crazy by the persistent itch caused by these little pests running about on them and feeding on them. We ourselves, may even have fallen victim to these tenacious creatures. With this article I hope to give you some insight into the life cycle of fleas and how to best control them during each life stage. Most importantly it should become clear, that controlling fleas needs a multi-pronged approach, addressing as many of the life stages as possible, to be successful. During the life cycle of the flea they develop from the egg, through 3 larval stages and a pupa stage, to adulthood. Have a look at the diagram above: This entire life cycle takes on average 3-4 weeks to complete. The adults live on the host, where they feed on blood before laying eggs. These eggs then fall off the hosts into the environment when the animals scratch and shake in response to the itch. The eggs take 1-6 days to hatch into small almost see-through maggot-like larvae, who feed on flea faeces and other organic matter, before spinning a cocoon and forming a pupa. The pupae usually hatch in about a week and the adults then jump onto a passing host. 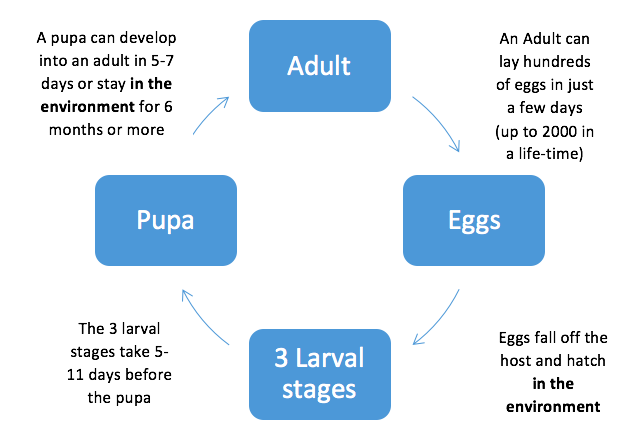 When however, environmental conditions are not favourable (freezing cold or wet), pupae can remain in the environment for up to a year before they hatch. Movement, warmth and carbon dioxide stimulate them to hatch. This explains why we can suddenly be overrun by fleas when the family comes home after having been away on holiday or when we move into a house that has been empty for a while! A startling fact is that only about 5% of this population is on our pets in the form of adults, the other 95% live in the environment, hiding in dark cracks between floor boards, in carpets, couches, mattresses and in the sand in our gardens. This is why it is so important to treat both our pets and the environment to achieve effective flea control. When starting the war on fleas, apply as many of the Outdoor and Indoor methods a possible to give yourself the best chance of success. Avoid piles of organic matter, (like compost heaps) as this is the perfect restaurant for developing larvae. In extreme infestations consider the prudent use of Karbadust in the sand. Carefully follow manufacturer’s instructions. Clean out your dog’s kennel weekly, washing the bedding, sweeping and even vacuuming the inside and exposing everything to direct sunlight. Vacuum your home twice a week (even if you have tiles) moving as much furniture as possible. Also vacuum couches and mattresses as these are ideal feeding places for larvae. Don’t forget the cat scratch post! Vacuuming not only removes eggs, larva, pupae and debris, the vibrations also stimulate eggs and pupae to hatch, making it easier for the environmental pesticide to be effected. (Remember to clean out the vacuum cleaner after each vacuum, otherwise the fleas simply hatch in the vacuum cleaner and jump back out again). In severe infestations and at the beginning of summer and winter, use an environmental pesticide in your home. Remember to remove all children and pets from the house when using these products and carefully following the manufacturer’s instructions and safety precautions. Vacuum before and 24 hours after using any of these products. An example is Ultrum Duration. Wash pet bedding once a week and hang it into direct sunlight to dry. Regularly brush you pet, then use a flea comb to remove any visible adult fleas. Wash your dog regularly. Once every 2-4 weeks is enough, unless he sleeps on your furniture or in the bed, then you may want to do it more often, Use any appropriate dog or cat shampoos. Don’t forget, that if you choose a tick and flea shampoo, this products will only work on the day of bathing and possibly a day or two afterwards, but have no long term residual effect. This means that any flea jumping to the dog a day or 2 after washing, will survive and reproduce. Frontline Plus: A monthly top-spot treatment for dogs and cats. The one active ingredient Fipronil kills adult fleas (generally before they lay eggs) and ticks on the dog or cat. The other active ingredient s- methoprene is a growth inhibitor which prevents the development of fleas, from larvae to pupa to adult. Fiprotec: A monthly spray-on treatment for dogs and cats. The active ingredient Fipronil kills adult fleas (and ticks). Advantage: A monthly top-spot treatment for dogs and cats. The active ingredient Imidolcoprid repels and kills adult fleas. Advantix: The Imidocloprid in this monthly top-spot product repels and kills adult fleas, similar to the Advantage product. It is only used in dogs as it also contains Permethrin (to kills ticks) which is toxic to cats. Revolution: A monthly top-spot product for dogs and cats used against fleas, ticks, lice and ear mites. It is also effective against some worm species. Seresto collars: These collars last up to 8 months on dogs and cats, killing adult fleas and ticks. This product also repels fleas and inhibits larval development. Program plus contains Lufenuron and Milbemycin. This monthly tablet does not kill adult fleas, but sterilises them thereby reducing the general flea population. It is used in conjunction with Capstar. Program plus also kills most intestinal worms found in dogs and cats, but is ineffective against ticks. Comfortis: This monthly tablet for cats and dogs is effective against adult fleas, killing them before they have an opportunity to lay eggs. NexGard: A monthly oral tablet (for dogs only) containing Afoxolaner which kills adult fleas before they have a chance to lay eggs. Also effective against ticks. Bravecto: A three monthly oral tablet (for dogs only) containing Flualaner which kills adult fleas before they have a chance to lay eggs. Also effective against ticks. Remember to discuss your product choice with a trained professional and to read the package insert before application. Fleas can be the Bain of our lives. They are frustrating, irritating and tenacious. A multi-pronged approach to the control of these pests, is always the most effective. Never only apply your product to your pet and assume that your flea control is now complete. Tackle the home, the environment and the pet and you will have success!